Under a board at the beach. why not just Porcellionides virgatus? Have specimens of these animals ever been sent to experts? Or have you seen more specimens since this original animal, Graham? This would be an exciting new taxon to add to official lists of the isopod fauna of the U.S.
No update yet! I haven't seen any of the same since. Thanks for the reminder. This is one of those specimens I just forgot about. I've sent myself a reminder and will look for them when I next visit the area. So, one expert says "that this specimen can be an Acaeroplastes sp. "; somebody else comments: "this is a guesstimate only, there is really a hand full of other species listed for Texas that I haven't got the faintest idea about and that might hence still look similar". Are there any records of this species in the US? Do we have enough reason to place this specimen under Acaeroplastes? Shouldn't we move it to family level until we can be sure? It certainly does look an awful lot like Acaeroplastes and had it been found in southern Europe I don't think we would need to think twice. But I'm also quite sure neither Emmanuel nor me would like to state with certainty that it is - especially as it would be a "new taxon" for the region. To make that happen you will really need a specimen, preferably or almost obligatory a male specimen even. Best to collect (half) a dozen or so and send them in. As it stands: No, you cannot be 100% sure that it is an Acaeroplastes, but if moved to some higher taxonomic level it might easily go under in the bulk of unidentified photos and that would be shame too. I have not looked at the other species listed by Jass & Klausmeier anymore since my last message, in part hoping Graham would come up with a few specimen. When I'm back home later this week I will compile a list of species recorded for Texas and adjacent states that are unknown to me and try to find the documentation for those (will require a trip to library in natural history museum). I'll also post that list with a link to this photo to a European mailing list to get some second opinions. I'm predicting that the other species, unknown for now, will not look anything like this and that it will hence be more probable still that this would be Acaeroplastes, but let's do the exercise anyway. Can we leave the animal at the current name for now? Is there a mechanism on BugGuide to indicate less than 100% certainty? Isn't that generally the case with photo IDs anyway? Your arguments make sense to me. Let us hope that we can unravel this mystery soon. I will add it to the List of Non-native Arthropods only when we are sure. Thanks for your efforts. I would agree with Emmanuel that it looks about right for Acaeroplastes, but wouldn't that make this an interesting find? Is there any documentation on previous records for this genus in Texas or even the USA? I don't own a lot of literature on American woodlice so I only have Jass & Klausmeier's 2001 "Atlas for Canada, Alaska and the contiguous United States" at hand, and that doesn't seem to list any Acaeroplastes. Of course, there are quite a few species listed for Texas that I have no idea about so there might still be some body double, but it seems to be a good idea to contact the image author and suggest to have another look to find some specimen and have those ID'd by a local specialist? Is there any "regulation" on contacting authors on bugguide? That's an exciting possibility! I will definitely look for these next time I go to the Bolivar Peninsula. I don't know any local specialists, but I'm sure I could find one. Thanks! Cheers, for wanting to have another look at some point :o) If it is Acaeroplastes this is not necessarily a "beach only" species. In Europe these are found in a wide range near the coast. It's more that they can "handle" saline environments and sandy substrates than that they need it. The most expansive species, Acaeroplastes melanurus, when found further inland is often associated with plane trees (Platanus) where it can also be found under the flakes of bark. All that said, please keep in mind this is a guesstimate only, there is really a hand full of other species listed for Texas that I haven't got the faintest idea about and that might hence still look similar?? you will be taken to his contributor page where you will find his email address. You can email him directly or wait to hear from him since he should get an email from BugGuide notifying him of your comment. A French isopodologist E. Séchet states in his remarks about this image, that this specimen can be an Acaeroplastes sp. (family Porcellionidae). ".. it seems to have the criteria given by VANDEL for the genus Acaeroplastes (Faune de France, 1962 : 626-627): central and lateral lobes of the head less developed, the posterior edge of the first pereionites rounded, not sinua. The pleon seems slightly offset from pereion." Hi! 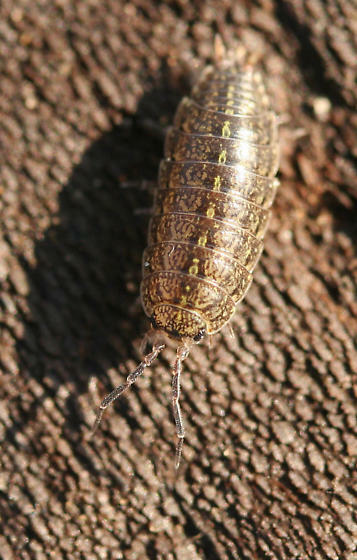 This isopod has long "cigar shaped" uropods, therefore it cannot be a pill bug. Please, remove it from the Armadillidiidae family branch. However, this isopod is definitely a new taxon on bugguide.net. It would be nice to have some more images on antennae and other bodyparts as well. From this picture, I`d say it`s close to Porcellionidae and Agnaridae. I am so used to seeing pillbugs that I assumed this was one. Thanks again! I will move it out of this family.